Early Warning Signs: Obsessive reading. Thinking about the book at times whilst driving, sleeping and showering. Staying up in to the night to finish the last three chapters. Stage 2: Sadness that you realise there is no more book to read. You hold the book limply in your hand and blink weakly at the world around you. Stage 3: Existential crisis. What are you going to do with your life now? You try to remember what your days were about before you started the book but it all seems foggy and distant. 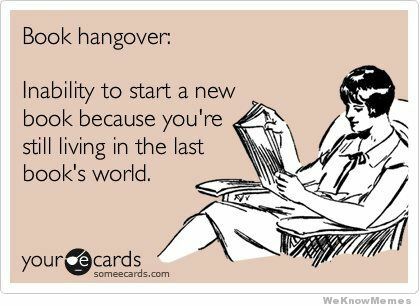 Stage 4: Disillusionment with every other book you could possibly read. You run your eyes over your bookcase but nothing leaps out. You pick up an old favourite but give up after a couple of chapters. The books in your “To Read” pile have never looked so unappealing. Stage 5: Acceptance. You realise that you are not ready to read right now. There is nothing for it but to feel the grief of finishing the last book and give it time. You enter back into the real world reluctantly and wait for your mind to stop returning to the last book. Stage 6: The cycle begins again. Then one day without thinking too much about it you pick up a new book and start reading. Down the rabbit hole you leap once more without a single thought of how you will feel when it’s over. After all, there are always more books to read! Eugh…I’m not making much progress with this. Three weeks of battling illness in the house and a busy church schedule has not left much time for reading. But I have managed to read one short book that was published in the last year, so I can tick off at least one more box on the list. Five get on the Property Ladder. OK, OK, this is a silly parody book and I am being a bit cheeky to include it on here, but honestly, this is the only book I have had time to read so here is my review. The Famous Five gang are about to get kicked out of their flat and need to find a new home. Mayhem swiftly follows as they house hunt under the guidance of a shady estate agent who may or may not be part of a smuggling ring. It is funny and has a more of a thought through plot than you would imagine. If you have read any of the original Enid Blyton books then you will pick up a lot of in jokes that poke fun at the Famous Five series. I surprised myself by actually getting quite invested in the short story and was very disappointed when the Famous Five did not get to live on the barge. That sounded quite nice to me! Apart from this light read of comic relief I haven’t read anything else in the last couple of weeks, however, my new early bedtime regime should allow me more time for reading so I am hoping to start making more progress. In fact, I am already into two new books that I started on Monday night, I didn’t pick them specifically to match any categories on the Reading list but I am so happy to be reading again, I don’t really care! I knew this early bedtime thing was a good idea!